It's not every day that you run across an entirely new strain of life, which is exactly what Dutch kinetic sculptor Theo Jansen has created. 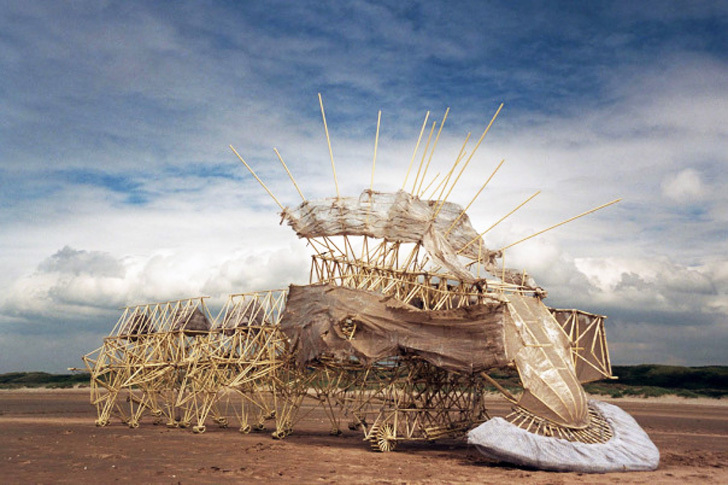 His Strandbeests are wondrous wind-powered automatons that exhibit incredibly lifelike dexterity as they cascade in flowing waves down seaside sands. These elegantly articulated creatures are constructed using genetic algorithms and are constantly evolving to better suit their environment. Constructed as intricate assemblages of piping, wood, and wing-like sails, Jansen’s creatures are constantly evolving and have become excellently adapted to their sandy beach environment. The creatures sport legs, which “prove to be more efficient on sand than wheels . . . they don’t need to touch every inch of the ground along the way, as a wheel has to”. The creatures are also able to store air pressure and use it to drive them in the absence of wind: “Self-propelling beach animals like Animaris Percipiere have a stomach. This consists of recycled plastic bottles containing air which can be pumped up to a high pressure by the wind.” Theo’s more sophisticated creations are able to detect once they have entered the water and walk away from it, and one species will even anchor itself to the earth if it senses a storm approaching. Watching a herd of them crossing a windswept beach would certainly be a sight to behold. 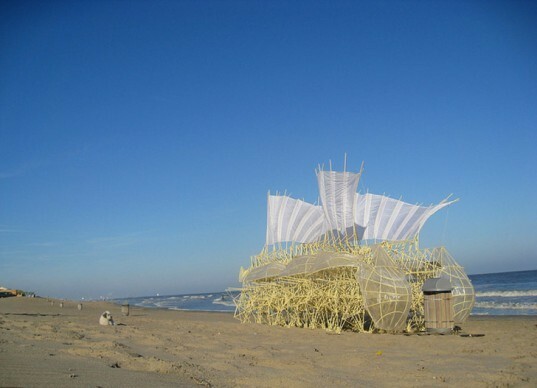 Where can one acquire such a Strandbeest? Please advise dimensions and costs? Amazing. I just had an Archigram flashback. that video of them walking was amazing & beautiful. it's just so graceful! Theo Jansen has been creating wind-walking examples of artificial life since 1990. What was at first a rudimentary breed has slowly evolved into a generation of machines that are able to react to their environment: " . . . over time, these skeletons have become increasingly better at surviving the elements such as storms and water, and eventually I want to put these animals out in herds on the beaches, so they will live their own lives."